The Law Offices of Goldfine & Bowles, P.C. If a serious personal injury to you or the wrongful death of a loved one has upended your life in central Illinois, the law firm that aggressively protects your rights in and out of court and through the workers' compensation system — in Peoria, Bloomington and Galesburg — is The Law Offices of Goldfine & Bowles. Our skilled, compassionate lawyers have settled or litigated thousands of claims on behalf of people like you since 1960. 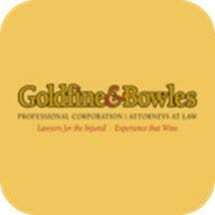 Goldfine & Bowles attorneys investigate the cause of your accident, clearly identify the party responsible and bring the facts of your case to negotiations with insurers. If discussions are not productive, we are prepared to represent your interests in a court of law. For those who have been injured on the job, we are dedicated to helping ensure that our clients receive the full workers' compensation benefits to which they are entitled. Throughout the legal process, you should have no worries about the cost of our quality representation. Thanks to the contingency fee basis for our work, you owe no attorney fee unless we win your case. For experience that wins when you need financial compensation to deal with lost wages, medical expenses and the pain and suffering of your recovery, contact Goldfine & Bowles to arrange your free initial consultation. Call toll free 800-409-1615. We can visit with you in your home or hospital room if your injury prevents you from traveling. For experience that wins personal injury claims cases in central Illinois, contact the attorneys of Goldfine & Bowles in Peoria. Call 309-740-9218 for a free consultation. Were you injured in an accident at your workplace? Goldfine & Bowles lawyers protect your rights. Call for a free initial consultation: 309-740-9218. If you suspect that an Illinois doctor or nurse betrayed your trust and committed medical malpractice, call the Peoria attorneys of Goldfine & Bowles: 309-740-9218. Goldfine & Bowles attorneys work hard for the financial compensation you deserve after an accident caused by negligence. Contact us for a free initial consultation: 309-740-9218. When you or a loved one is seriously injured in a car accident caused by someone else, Goldfine & Bowles attorneys aggressively protect your rights. Call today: 309-740-9218.